So I was hoping to do this post a lot sooner but as usual, things didn't quite go as planned. This past week has been a whirlwind of excitement, emotion and change. I'm not even sure where to begin. I want so much to remember all of the details so that 20 years from now, I can remember it as though it just happened. So this will be a bit longer of a post...I don't expect most of you to read all of this, but there are pictures at the end! Monday the 17th was Martin Luther King Jr. day and so Jackson had the day off. I was finally feeling better and so we ventured out to run errands. We went to get his eye exam, we ate dinner at Sweet Tomatoes (I had really been wanting to go there-and we ate like senior citizens at 4:30 in the afternoon!) and then went to Target where we got groceries and stocked up on diapers and other baby items. We went home and hung out while I got some sewing done. I had actually called the doctor around 8 pm because I though maybe my water had broken but I wasn't sure and so we decided I would stay home and just keep an eye on things. I woke up around 1:15 in the morning and thought at that point that my water had indeed broken. So I got up and folded a load of laundry (I have no explanation for that...) and then woke Jackson up at around 1:30. We were already packed so we just needed to get ourselves dressed and pack the car. At this point I was still doubting that I was going into labor and figured they would just check and send me home. Had I known for sure, I would have stopped to eat something because they don't let you eat or drink while your in labor-ice chips only and I ended up going about 27 hours without eating! We arrived at the hospital by 2:45 and checked in at security and waited for them to take us back. After registering they took us to triage where they confirmed that my water had indeed broken and told me that I would be admitted. At that point I called my mom (around 3:20) and asked her if she was ready to make a drive to Tampa. I think she was a little groggy but definitely excited! I was quickly taken the an L&D room by Carrie and Kim, two fabulous nurses that I work with, who were so excited to see me (and I them!). I'd spent so much time in L&D during this pregnancy while at work that it seems they were just as eager to have me go into labor as I was. They took wonderful care of me and I had an epidural placed by 6:45 am (even though I was only 2 cms....). 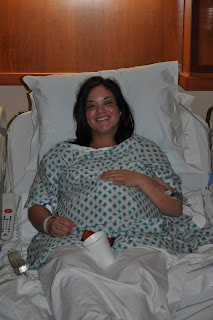 I enjoyed feeling no pain as they cranked up the pitocin pretty fast in order to get the contractions stronger. My parents arrived at around 9:15 am and I was so glad they made it in time to be there with me. We had lots of visitors throughout the day including my parents, Jackson's parents, several friends from church and my nursing friends from the NICU. I had an awesome nurse taking care of me-Rei, and I tried to be a good patient! Overall the day went by pretty fast and easily, although the words c-section were mentioned as the little man wasn't wanting to drop down initially and then he started having some drops in his heart rate during contractions. I prayed more that day then I think I had in my entire life. Working where I do and seeing what I see, I prayed that God would allow me to deliver a healthy baby boy. Around 6 pm Dr. Bevilaqua gave me the go ahead to start pushing, but told me that it would probably take me 2 hours. I decided she was wrong and promised Rei I'd have the baby out in time for shift change (7pm) so that she could leave on time. 50 minutes later, Jackson entered the world, beautiful and healthy. I have tears in my eyes even as I recall this as I still can't wrap my brain around the miracle that it truly is. Two of my friends came down from the NICU to make sure he was ok as there was a little meconium, but he came out crying with eyes wide open and looked absolutely perfect. Daddy cut the cord as grammy took pictures and I strained to get a glimpse of my firstborn baby. After what seemed like an eternity, I got to hold him. It's a moment that will forever be etched into my heart and something I will never forget. He weighed a healthy 7 lbs 6.8 ounces ( a lot smaller than anyone gave him credit for!) and 20.5 inches long. Soon after we had several visitors, including both sets of grandparents, Jenn and Amy, pastor Ken (aka Poppy) and the Griffins. About an hour later (while the Griffins were visiting) I began my one person tribute to the exorcist and began throwing up violently and didn't stop the whole way up to my postpartem room. My poor baby got sent to the nursery since I was too sick to take care of him and Jackson stayed with me, trying to keep me comfortable. Turns out I had a complication from the epidural which causes extreme migraines (although a migraine sounds comfortable compared to the pain that I was in) and for the next 12 hours I could barely lift my head up. They took me to have a blood patch done to take care of the problem and I came back to my room drugged but feeling better. I progressively felt better and was able to be discharged on schedule on Thursday. I am so thankful for the amazing nurses and doctors that cared for me. I got a fresh perspective being the patient and I am so grateful for what they do. All this to say, we couldn't be happier with our sweet little boy and I thank God every day for bringing him into my life. I know this was a longer post, but like I said, I want to try and write down as much detail as possible so that when my mind starts to go, I can at least read and remember! My goal tomorrow is to chronicle some of the events of his first week (and post lots of pictures!) and slowly get back on track so I can update daily (that's my goal at least). I want this blog to be a way for me to remember our life as a family and allow my relatives and friends to keep up with what is going on with us. And because you suffered through all of that detail, here are some of the pictures from Jax's birthday! Father and son meeting for the first time...love this picture! Thank you all so much for the kind words, prayers and encouragement over this past week. We are truly blessed and give thanks to God for our growing family. "Behold, children are a heritage from the Lord. The fruit of the womb is a reward." This is so wonderful, Jessica!!!!! Congrats on your handsome baby boy! How exciting for you guys!